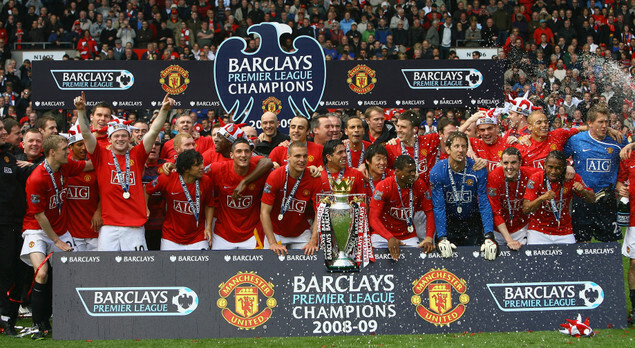 With the season set to kick off at 12:45 GMT on Saturday, 15th August 2009 (that’s tomorrow), here is a brief look at each of the Premier League’s 20 teams. I’ll try to stay clear of the cliché-fueled drivel you may find on other sites that are just paraphrasing more ‘reputable’ news sources and their so-called experts (whom many I suspect collude with one other as to not sound foolish). In my attempt not to sound as foolish, I will also steer clear of making outright predictions of where a team will finish. I’ll leave that to the ‘professionals’. Nonetheless, I will try to capture where a club stands and where they may be heading. With each of the big 4 clubs undoubtedly weakened and the emergence of a new challenger, we should be in for another exciting season. Can they win for a record 4th time in a row? The big question here is obviously how they will cope with the loss of Ronaldo, and to a lesser extent, Carlos Tevez. Fergie has somewhat answered these uncertainties with his declaration that Rooney will play in his favored central role and his admittance that he used Berbatov incorrectly last term. A return to the traditional 4-4-2 formation looks likely (how did they win the Treble again?). This alone will not make up for the loss of Ronaldo’s goals – underachievers Nani and Anderson must improve this term if United are to retain their title for an unprecedented fourth time in a row. Carrick and Fletcher have been the unsung heroes of the team the past two seasons, and they should continue to go about their business quietly but effectively. The back four looks strong as ever, with the Da Silva twins proving capable backups. However their are questions surrounding Van der Sar’s eventual replacement in goal. Also, who knows if Owen will return to form? But even with these lingering questions and the loss of Ronaldo, this team will challenge for top honors on all fronts, although I suspect the Champion’s League is Fergie’s main priority. After coming so close last year, hopes are high on Merseyside. What’s it been, 19 years? Surely it’s time? Unlike their neighbors, Liverpool fans need the league. The recent departure of Xabi Alonso may put a dent in those hopes though. And who to blame for that but the manager? It was Benitez after all who went around blindly confessing his love for Gareth Barry only last summer, alienating Alonso in the process (Benitez now hates Barry). Rafa has since secured a replacement in Alberto Aquilani, but I think he’ll spend most of the season adjusting to the change of pace. Liverpool must hold on to Mascherano, who remains on the watch-list of Barca and who’s wife remains unsettled (it’s not only Alex Curran, then) because if he goes, they are screwed. But fans still have reasons to dream – a full season of the Torres/Gerrard (apparently a keen martial artist) partnership could bring them that elusive Premier League title. Another team I believe has Champion’s League glory firmly in its sights. They didn’t bring Ancelotti in to win the league and it’s no secret Abramovich dreams of conquering Europe. The new boss prefers his own ‘diamond’ formation, something the players struggled to get used to, as displayed by the 1st half of the Community Shield. They proved to be quick learners however, as they outplayed United after the break. Chelsea are also the most unchanged team out of the top 4 (despite City’s attempts) and if Football Manager is anything to go by (many swear that it is), the addition of Yuri Zhirkov will do wonders for the club. They seem to have been flying under the radar this summer but disregard them at your peril. Another season, another ‘are they ready?’, ‘no, they’re too young’, ‘next year…’ saga. In a surprisingly candid interview with The Times Wenger finally admitted he often lies when he says, “I did not zee ze incident” after one of his players hacks an opponent down, in clear violation of the ‘Arsenal code’, thus bringing an end to one of the longest running jokes of the Premier League. But more importantly, he revealed that this is the season which will determine if his Arsenal ‘project’ will be a success. This is a “massively important year” for the gunners. His words, not mine. A peculiar way of going about his business with that in mind, don’t you think? Offloading established players, to direct rivals and putting pressure on newer, younger recruits to dive off the deep end (Jack Wilshere). It just sounds all to familiar to me and maybe this season it will all fall apart. But maybe it won’t. Arsene’s teams always seem to make it… just. It just doesn’t sit right with me to sell two of your most established, experienced and celebrated players to a direct rival. I mean, Manchester United sold Silvestre to Arsenal, but I think gooners have found out why…no need for me to tell them we’re still laughing at that deal. Bottom line for me is they finished 18 points behind 1st place, 11 behind 3rd and there haven’t been any improvements to the squad (sub Vermaelen), so how are they going to better that mark with the competition getting better? You can go on about injuries, but all clubs have them and all clubs deal with them. No question about it, this is a huge season for Arsenal. The fans won’t stand for another excuse-ridden season. Here’s a closer look at why I’d be worried If I was an Arsenal fan. Knowing Arsenal, they’ll probably prove me wrong but I still think there is genuine cause for concern here. After finishing 5th for the second time in a row and reaching Wembley, the Toffees will unfortunately find it difficult to improve. Lescott continues to have his head turned by City’s offer despite the club’s refusal to grant his transfer request. History This Summer has shown us that City do not give up easily and I would not be surprised if a deal is completed before the transfer deadline early next week. If he goes, then Everton are in trouble. They already lack depth, with Jacobsen, van Der Meyde and Nuno Valente gone but nobody in to replace them. In addition, their star player and easily the best player not on a top 4 team, Mikel Arteta, will not be fit for the start of the season. Neither will Yakubu or Phil Jagielka. At least Jo has signed on loan, giving them valuable cover for Saha’s glass knee. When healthy, this team is a force to be reckoned with but with no funds to shore up the squad, imminent injuries down the line will make it hard for the team to improve. They must ride their luck if they are to have hopes of breaking into the top 4. I have a soft spot for this team and often find myself playing as them in FIFA. I don’t know if I’m going to be doing that anymore though, as Gareth Barry and Martin Laursen have left gaping holes for Martin O’Neill to fill. Only he won’t. Or he can’t. Well he’s not Arsene Wenger, so I suggest it is the latter. They bear a striking resemblance to Everton in this respect: enormously talented squad but lacking in depth. One or two injuries could spell the end. O’Neill did manage to pry Stewart Downing away from the Championship but he’s injured and won’t feature for at least another two months. However, they do have two of England’s most talented youngsters in Gabby Agbonlahor and Ashley Young. Both are lighting quick, but the Premier League is more a marathon than a sprint. Agbonlahor in particular learned that the hard way at the end of last season. Similarly to Everton, it will be hard for Villa to improve on last season’s mark due to a thin (albeit very talented) squad and a very long season ahead of them. Narrowly escaping relegation in 2008, Fulham surprised everybody last year. With the addition of Andy Johnson, Zoltan Gera and the success in fending off suitors to Hangeland, I can say that this squad has clearly improved on paper from last year. Coupled with the troubles at Villa and Everton, could this be another magical season for the Cottagers? Some people seem to think so but I bet Europa League football hinders their league form and they drop back into mid-table mediocrity. This team is my dark horse for the upcoming season. After receiving all the attention during last year’s buildup, they got off to a horrendous start and could never really recover. That is, until Harry Redknapp took over – he’s been busy ever since. Spurs have gone on to sign Crouch, Defoe, and Keane among others but have barely featured in the media. They have an abundance of quality players in midfield and attack, something that will certainly be used to their advantage as the season wears on. Their only worry is at the back with Ledley King and Jonathan Woodgate consistently on the treatment table. I think they can look forward to a top 6 finish, if not better. Watch out. Zola and the Hammers will try to push for a Europa league spot this season but with uncertainty surrounding their finances. But barring any off-field hiccups such as the near-bankrupt Icelandic Bank deciding to sell the club’s best assets, their primary problem is the lack of strikers. Dean Ashton is absolute quality when fit and is a personal favorite of mine, but he can’t stay fit for more than 2 games. Carlton Cole remains the only real striker in the squad, after Tristan and Di Michele were released. Hence the club’s links with various out of favor strikers (or strikers turned midfielders who would be asked to convert back into strikers) across the continent. You need goals to win games and at the moment, I’m not sure this team’s got any in them. Zola is a fan favorite of nearly everyone and we all want him to do well. I don’t care what the experts say, they can’t tell me this doesn’t sound good: Adebayor or Santa Cruz up front, flanked by Tevez on the right and Robinho on the left. Barry, Ireland and De Jong playing behind them in a 2-3-1 or a 3-3 formation. Shay Given would start for England. The back four is shaky but Lescott wants to join and City won’t be too discouraged by shelling out a few extra million. Richards, Zabaleta, Bridge, Lescott, Toure, Dunne, Kompany – make no mistake about it, this is a formidable team. Much has been made of the ‘mercenary’ tag the press have put on many of City’s new recruits but this is complete and utter garbage born out of the English media’s distrust of anything/anyone with a lot of money and foreign. The doomsday predictions continue to dominate headlines, but I walk to a different tune. They missed out on 7th place by a mere 3 points. Nobody mentions that. Nobody seems to realize that the owners have set the top 6 as their target either. They will reach it. They may push for fourth. I don’t know much about Roberto Martinez. But I will venture a guess that managing Swansea is a far cry from managing a Premier League side who will probably be battling relegation this season. The heroes of the Wigan footballing fairy tale: Heskey, Valencia and Zaki have all moved on. Perhaps Wigan will go back to being a Rugby town? They surprised most people when they secured their premier league status at the tail end of last season, but that won’t change peoples’ perception of them. Another hard season awaits. I would be willing to bet they stay up again, but that would be down to the incompetence of those around them rather than their own doing. The first thing that comes to mind when I think about Bolton in the 09/10 season is the kit. Probably the worst in recent memory. Whoever thought this was a good idea should be fired, as well as those in authoritative positions who cleared its release. Anyways, I don’t see much changing from a side that traditionally isn’t the purest of footballing teams. Another mid-table season for Megson’s men seems the most likely outcome. Almost everything that could go wrong, did go wrong this summer for Pompey. They’ve been forced to sell half their first team and let go of many others who took up space on the wage bill. Pompey fans will worry, who’s next to go? David James? Niko Kranjcar? I fear the side on the south coast will face a season-long battle with relegation. And if they go down, things will only get worse. They won’t be coming back up for a long time. Another team that could be tricky on their day, but won’t break out of mid-table mediocrity. After Mark Hughes, they’ve gone downhill and Sam Allardyce’s appointment has failed to energize the team as expected. People are starting to think if he was just a one-hit wonder with Bolton, as he didn’t exactly impress on Tyneside either. But with a full pre-season in charge, maybe he can work some magic – Bolton and Blackburn are very similar and he got Bolton into Europe. I don’t think that’s a possibility this season but if they get closer to 10th this year, then next year they will push for Europe. The Black Cats are a team I think improved dramatically this summer. Steve Bruce has brought in Frazier Campbell, Darren Bent, Lorik Cana and Lee Cattermole. The latter 3 I think are great buys and their styles suit the grind of the Premier League. This could be a very promising campaign from those on Wearside and their hopes are justifiably high. I think they’ll be the most improved team in the league this year. Something is not quite right with Hull, and it’s not just Phil Brown’s fake tan. He’s lost the respect and confidence of the dressing room following the team’s collapse in the second half of last season. They’re also another team with a glaring lack of goalscorers. Although I’d like to think Jozy Altidore could help them, the 19-year old American is not going to fix their problems. Speaking of problems, Michael Turner has attracted the attention of Liverpool. Hull was clearly ‘figured out’ last season, and this does not bode well for the future. Expect relegation looming for the entire season. They are the yo-yo of English teams. But with the quality of the teams around them also in question, maybe they can put off their eventual drop for one year? I’ll admit I do not know much about these new boys, seeing as they haven’t been up in the Premier League before. However, Owen Coyle’s team pulled a few surprises last year with victories over Fulham, Chelsea and Arsenal in the Carling Cup. These are teams that play football (as oppose to hacking players and hitting the long ball) and it shows Burnley can play. However, you can’t treat every game like a cup-tie and it is unclear if they can maintain form over large stretches of time. They also face United, Liverpool and Chelsea in their first 5 matches. Relegation favorites for many, but I think they can stay up. If there was one newly-promoted side I had to pick to stay up, it would be Wolves. They’ve got no problems with goals, as former Manchester Untied player, Sylvan- Ebanks Blake scored goals for fun in the Championship. They’ve also made a shrewd signing in Kevin Doyle. Defense would seem to pose a problem, but there are plenty of teams who leak like a sieve and maintain their premier league status. This entry was posted on Friday, August 14th, 2009 at 4:30 pm and is filed under Footy. You can follow any responses to this entry through the RSS 2.0 feed. You can leave a response, or trackback from your own site. i just “discovered” the EPL and i love it! i’m in the states so it’s not like i know soccer, but i have an interest in Hull since they just signed Jozy and they did have scoring issues last year. i found your blog on one of the soccer comments and i have really enjoyed the read..thanks! As you have rightly pointed out, Watch out for Tottenham Hotspurs. Under Harry Redknapp, I think they will spring a surprise or 2 and might even win the FA cup. As far as the top of the league is concerned. United and Chelsea should be neck and neck till the end with Liverpool chasing them all season. And it is a massively important year for Arsenal as Arsene Wenger will finally understand that his ‘project’ at Arsenal is a failure.